Whether the project is measuring the depth needed for a skyscraper’s foundation or mapping backyard boundaries, a surveyor steps in to get the lay of the land. Surveyors use sophisticated technology to take precise measurements of the Earth’s surface for maps and construction projects. They prevent—or help to resolve— boundary disputes for both home and business owners by documenting legal property lines, and helping determine the exact locations of real estate and building projects. During construction, surveyors determine the precise location of roads or buildings and proper depths for building foundations. They conduct research on land records and titles to show changes to a property line, and report on restrictions, such as the type and size of structures that may be built on a property. Most surveyors work for surveying or engineering companies; some work in construction or for government offices. Although surveyors spend time in offices, fieldwork is essential, and often involves standing for extended periods and walking long distances, sometimes hauling heavy equipment, in all kinds of weather. Most work full time. 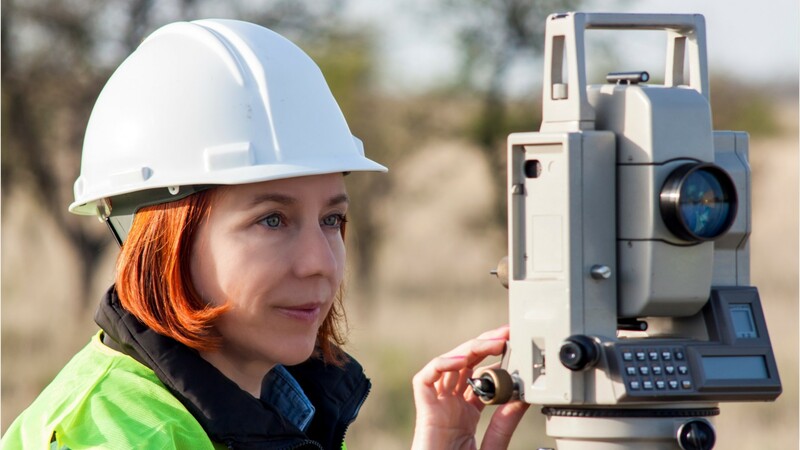 Surveyors typically need a bachelor’s degree in surveying, or a related field. A license is needed to certify legal documents and provide surveying services to the public. In addition to passing the licensure exams, surveyors generally need several years’ experience working under a licensed surveyor to obtain a license. See more details at O*NET OnLine about surveyors. Surveyors by U.S. Department of Labor, Employment and Training Administration is licensed under a Creative Commons Attribution 4.0 International License.